Touring a puppet show is always challenging, but when the show in question involves shadow puppets, things become especially tricky. 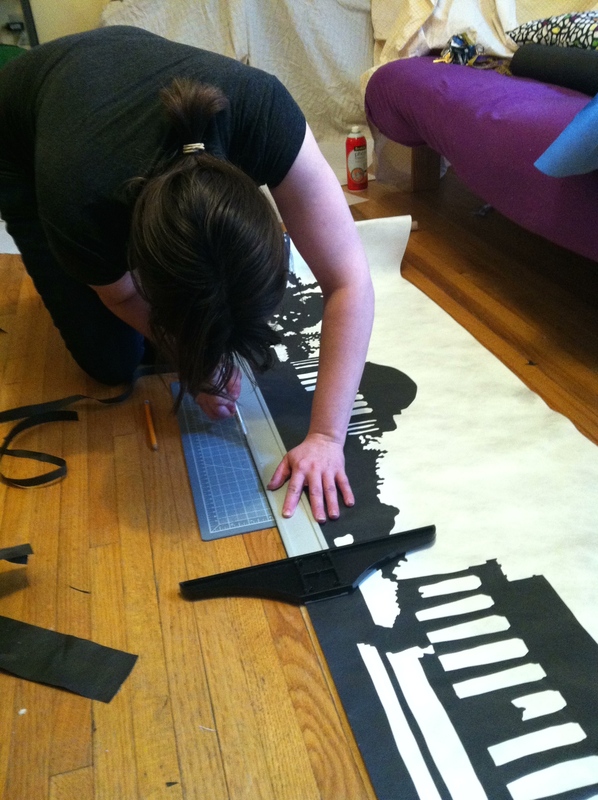 Shadow puppetry depends on the interaction between light and objects (usually flat cutout puppets made of cardstock). 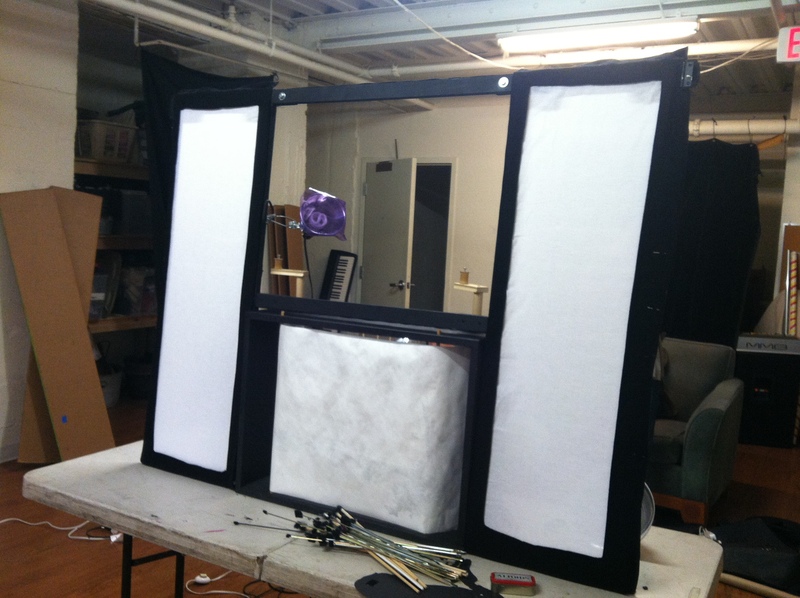 This means that controlling light sources becomes even more vital than it would be for another kind of puppet show. In a theater, that is fairly easy. Most theaters are built without windows, so there’s no extra light spill to interfere with the shadows. But our show Saudade was intended from the beginning to be an outreach show; a piece that is shared in community spaces such as schools, churches, libraries and community centers. And almost all of these spaces have, well, windows. The perfect shadow puppet space, with side light on the audience but not the enclosed stage. 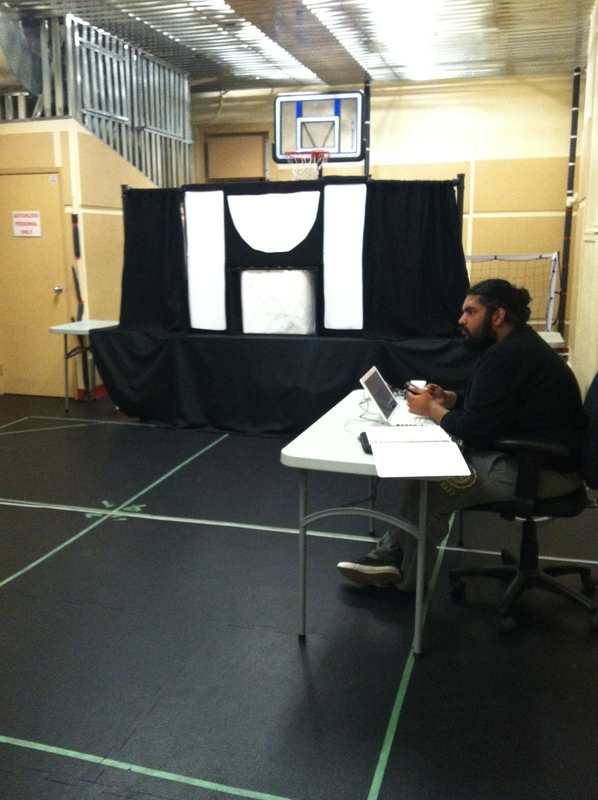 When we get to a new performance space on tour that has windows, placing the stage becomes extra important. We’ve had lots of discussions as to how we can achieve the best lighting: do we worry more about light spilling onto the screen from the front and perhaps washing out the shadows? Or do we worry about light spill from behind, which could distort the shadows or reveal certain images before they are intended to be seen? This was a good setup–no windows behind the stage & blinds that blocked most of the side light. Sometimes we attempt to cut off the light with curtains, venetian blinds, or shutters and hope for the best. Often we are setting up the show a good hour before we start, which means that the sun can sink lower in the meantime, finding its way through cracks in the curtain or blind. We have fond memories of how various venues have gone the extra mile to try and block windows, including covering them with trash bags (at a transitional school in Winnipeg, Canada) or with large sheets of cardboard (at a church in Minneapolis). For the record, cardboard works the best. This was the pitch black gym that made the kids scream in Winnipeg! In the end, not all light spill is terrible. It can be helpful to have just a little bit of light as we go through scene changes and prepare puppets for upcoming moments. It can also help the audience feel more comfortable. We did one show in Winnipeg at an after-school program where we were performing in a gym with no windows and it was pitch black when the lights first went out. Not only did that make several of the children scream (whether with fright or anticipation I’m not quite sure) but it meant we had no help whatsoever when trying to find the next puppet if one screen light had gone out and the next one wasn’t on yet. As a result, there were a few fumbles when the wrong puppet was picked up and had to be fixed quickly. 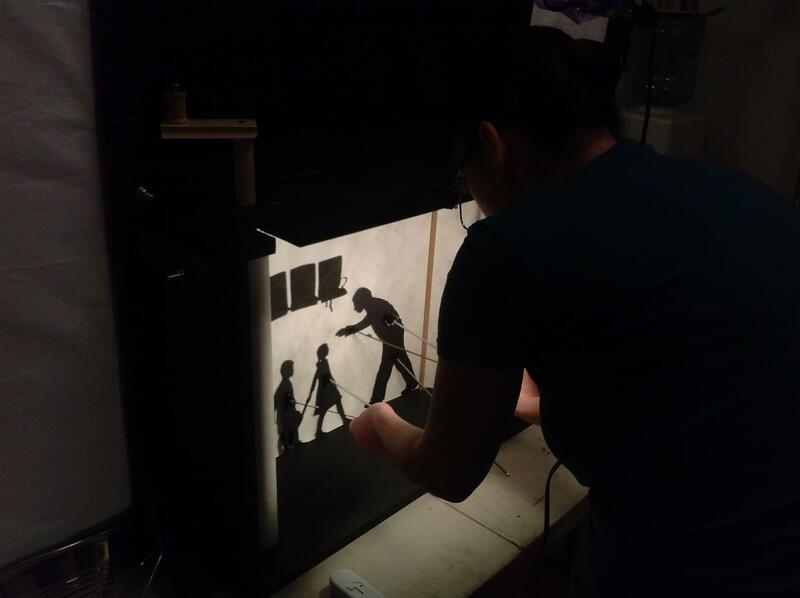 Light is essential to shadow puppetry and controlling it is a must when considering where and how to take a shadow puppet play on tour. We hope this post can help other people with these challenges when taking shadow puppets on the road. 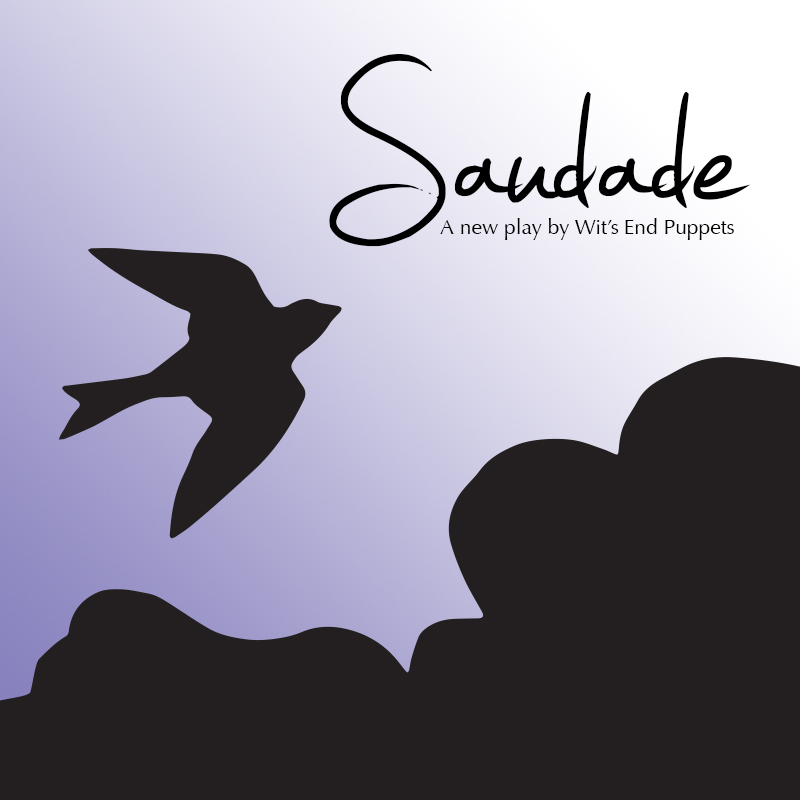 Our March tour of Saudade is halfway done and it’s World Puppet Day! If you haven’t had a chance, check out this new trailer and a few other blog posts about amazing puppetry and puppeteers from around the world. The entire show of Saudade. 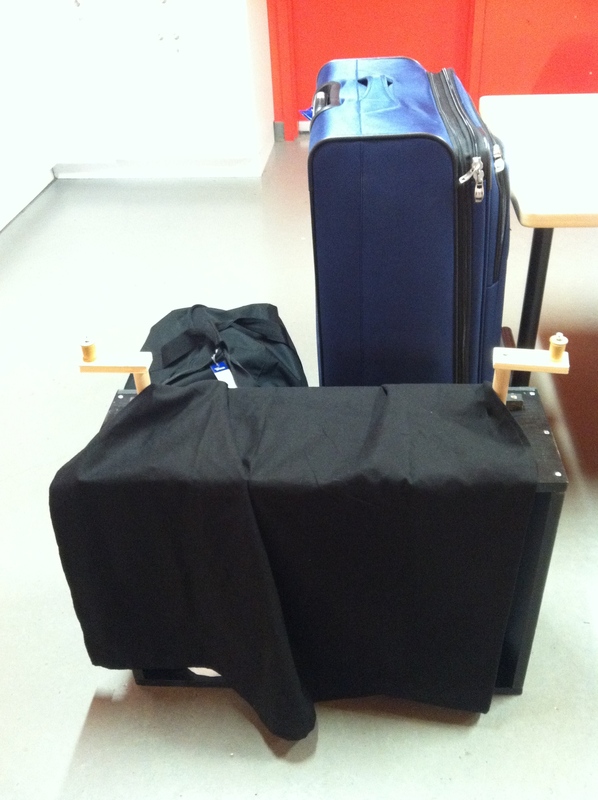 Everyone was very impressed by our packing abilities! The poster for the festival. 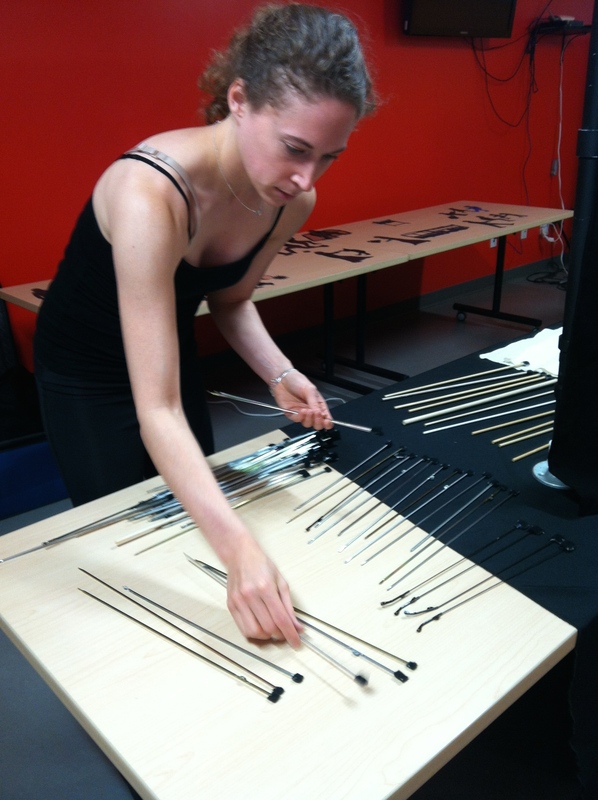 Genna sorts control rods before a show. 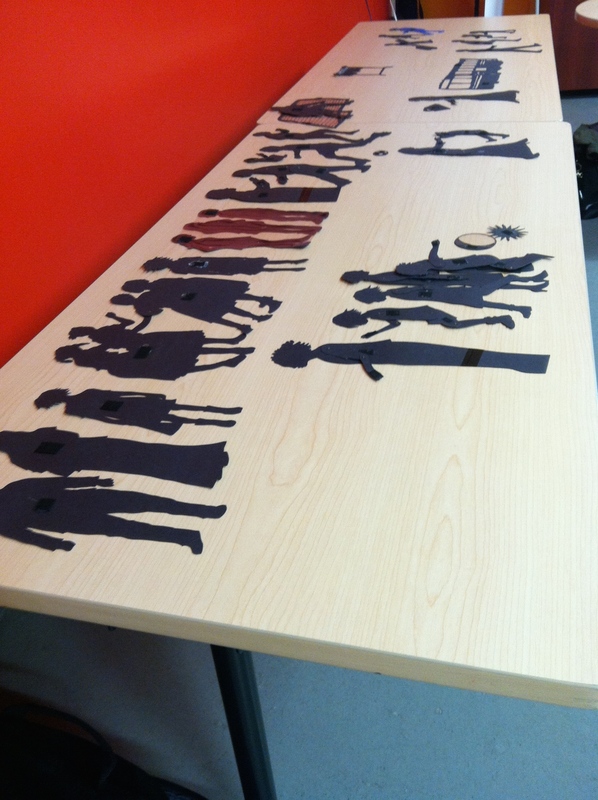 The puppets (60 in total) laid out ready for a show. We performed in the gym at the NEEDS center, a community space for newcomers. Our fantastic sound guy, Hassaan is at the computer. Talking with the kids at the NEEDS Center after the show. 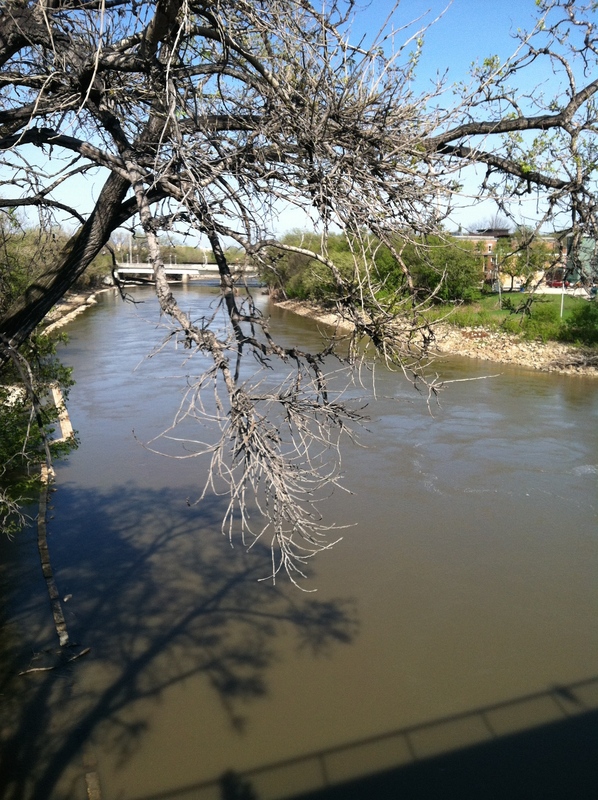 The rivers of Winnipeg are beautiful in the sun. 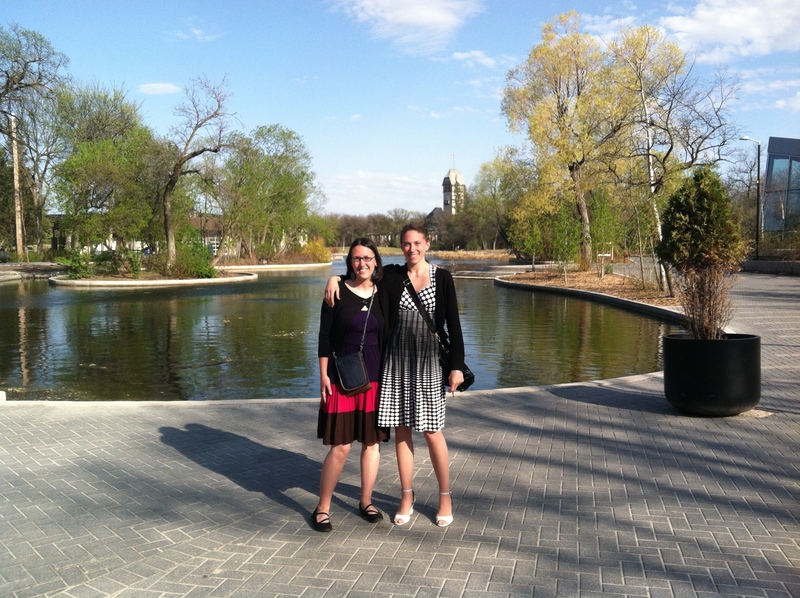 Cecilia and Genna at the opening dinner of the festival. 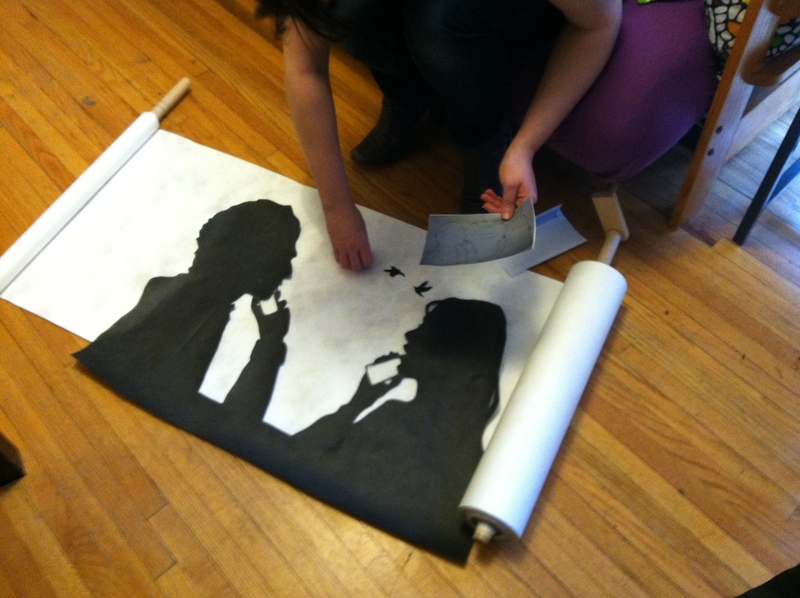 Like many artists, I am rarely satisfied with the first iteration of a project. After the performances of Saudade at the Intersections Festival, we had lots of conversations with audience members and each other about what could be clearer, stronger and more powerful in the piece. From puppet movement to sound, to crankie images, we examined each element of the project to see what could be improved. A new frame! We hope this will make everything a little more visible to the audience. 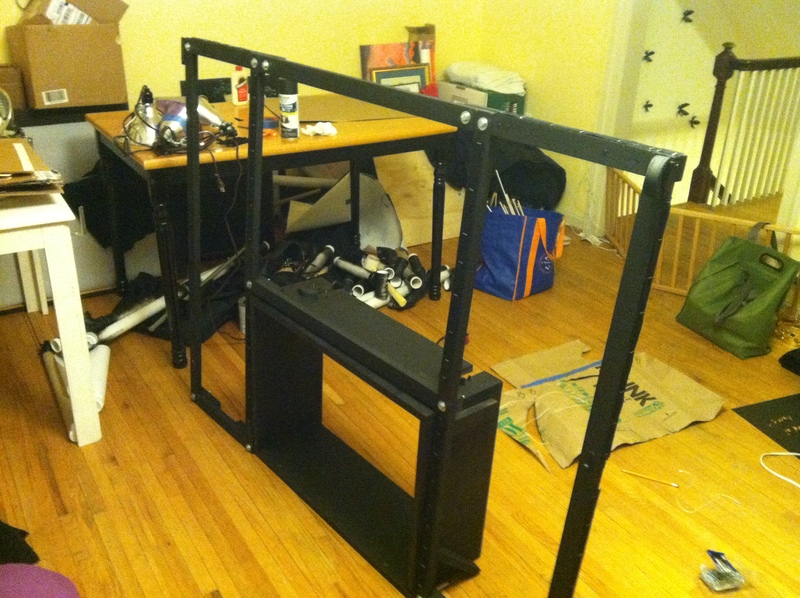 Here, the fabric panels are coming together and the crankie is in place. We’ve added scenes to the end of the show. 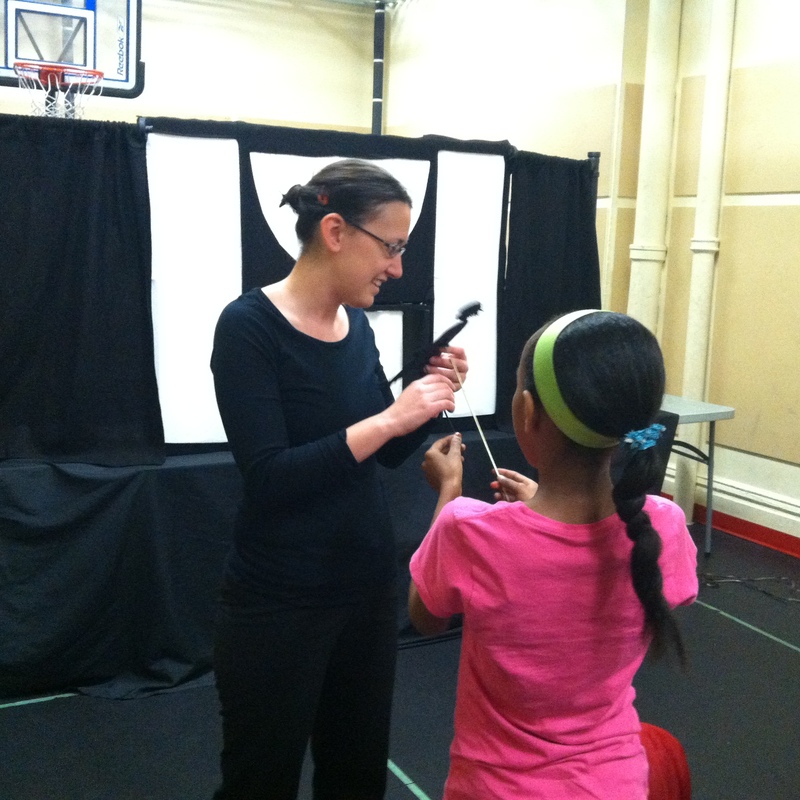 Here, Cecilia tries to manipulate three puppets with two hands. Wit’s End Puppets is taking to the road! Or the plane, as a matter of fact. 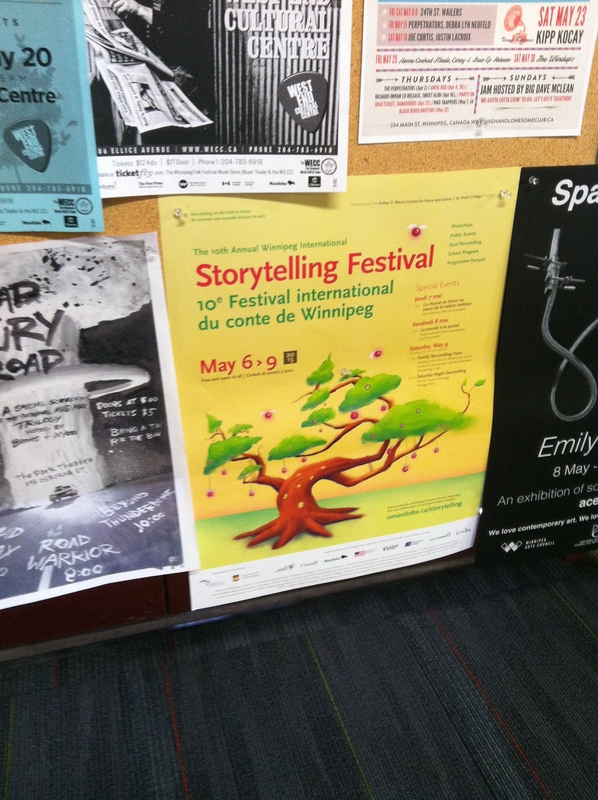 We have been invited by the good folks at the University of Manitoba’s Mauro Center for Peace and Justice to perform Saudade at the Winnipeg International Storytelling Festival in May. 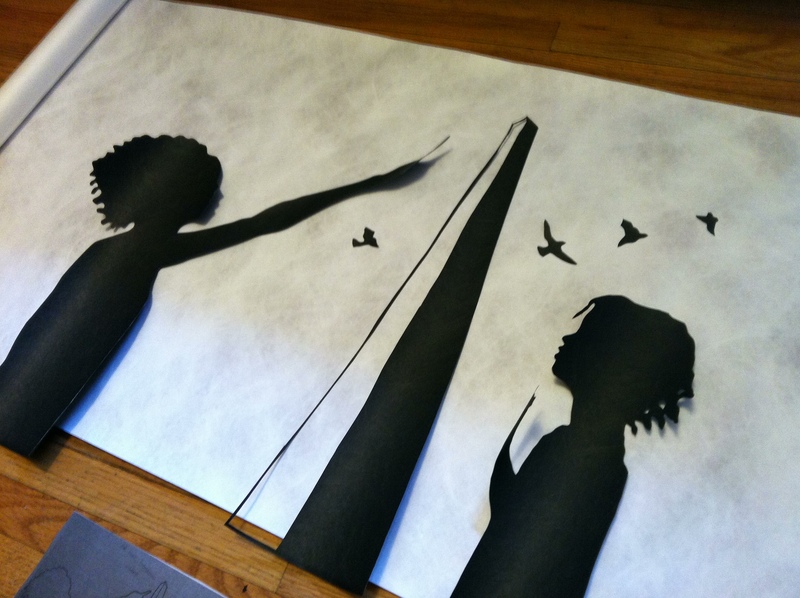 Amy is carefully placing the tiny paper birds between these two silhouettes. A new scene added at the end of show. 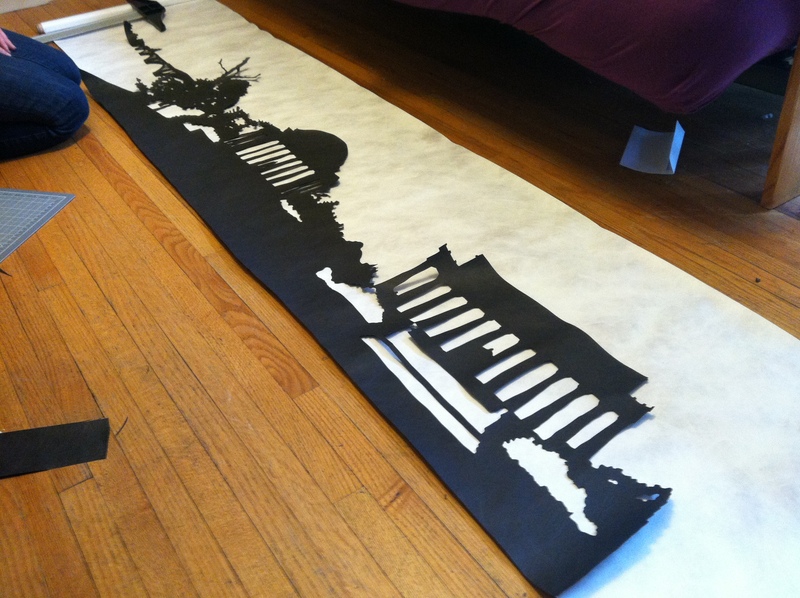 The ending images were all cut in one long big piece this time. We have to carefully cut off the bottom edge to make sure everything matches.